Skyline Street ... designed considering the challenging environmental conditions of the Middle East. Sylvania Lighting, a lighting solutions specialist, has introduced the Skyline Street range, dedicated to road lighting applications and specifically built for the Middle East region. The concept, which came to fruition after months of development, is state of the art in that it’s highly efficient, easily customisable to client requirements and is smart-technology enabled. “Our research and development team, which has some of the most experienced streetlighting experts in the industry across the globe, put in a lot of time and effort to optimise the thermal performance of the product while achieving high efficiency,” a spokesman for Sylvania tells Gulf Construction. Skyline Street ... a key design consideration was to reduce glare. It took the team around a year to achieve the market-leading lens performance, and excellent thermal performance (at 50 deg Celsius). “In order to have an edge over the competition, Skyline Street was designed by considering the very stringent and challenging environmental conditions of the Middle East region, and was put to severe testing to prove its operational suitability in the Gulf region,” says the spokesman. This was made feasible using advanced thermal and optical simulation tools and building a number of prototypes to verify Sylvania Lighting’s design parameters, he adds. While creating the lens designs, Sylvania engineers not only ensured they can be applied to both luminance and illuminance scenarios but also considered minimising light spill, to get the product ‘Dark Sky friendly’. An important consideration was to reduce glare. “This not only allows drivers to see well ahead on the road, giving them time to respond to any emergencies, but also avoid any distraction by the light sources above the drivers’ heads,” says the spokesman. Another important aspect that Sylvania Lighting considered was product flexibility. “By this we mean the potential of customisation to the needs of clients. 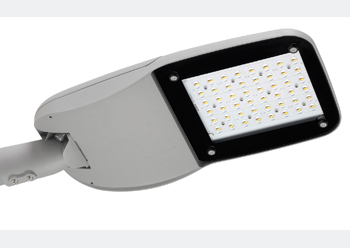 By fine-tuning design parameters and considering design trade-offs, the product can be tweaked to achieve very high luminous efficacy (in ranges of 140 LPW), or to provide it with custom-designed lenses catering to even in the most challenging lighting scenarios,” explains the spokesman. With Sylvania being at the forefront of smart lighting technologies, the Skyline Street range has been equipped with optional accessories allowing it to be connected to a smart network, either wired or wirelessly, depending on customer preferences. For the product’s wireless interface, Sylvania has chosen the all-popular Ansi/Nema socket standard, firstly because customers prefer this to other standards, and secondly because it allows a better cross-compatibility across luminaires and nodes. Additionally, the said socket is a better future-proof solution compared to other wireless interface standards, while not requiring special or proprietary drivers to be used, which again ties the hand of the customer, in case of an upgrade or driver failure, the spokesman points out. 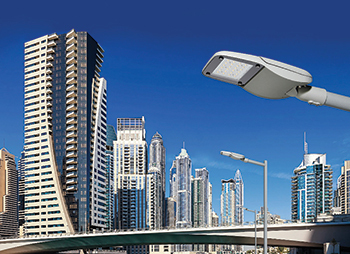 Sylvania Lighting was awarded with the certifications from Emirates Nuclear Energy Corporation (Enec) and Abu Dhabi Abu Dhabi Quality and Conformity Council (QCC) for the Skyline Street. It is also in the run to acquire certification from Dubai Road and Transport Authority (RTA). Sylvania is a brand of the Feilo Sylvania Group with over a century of expertise in lamps and luminaires. It supplies state-of-the-art products and systems to the public, commercial and private sectors. Customers across the globe use Sylvania solutions, such as Start, Sylvania, Concord and YourHome, for top-quality, energy-efficient solutions to suit their individual lighting needs.